I’ve found, even after more than twenty years of writing novels, that every book finds its own working method. No two books are the same, and no two books come into being by the same means. Despite being utilised by a number of authors and editors, the standard three act structure developed for Hollywood screenwriting has not yet made inroads into the novel. So there is no readily available map or blueprint. This, I believe, is a good thing. It allows a novel to find its most individualised voice and form. I love scriptwriting with all my heart, and write film scripts using the three act structure, but writing a novel is a much more personal experience. It is, truly, an adventure of the keyboard, the pen, and the mind. No two books are the same, and no two books come into being by the same means. Once I have a basic idea that excites me, I start a notebook (strictly paper at this stage), a space where every idea I have can be quickly jotted down. The notebook comes with me on the bus, the train, it lies next to the bed at night. Ideas can turn up at any time, and they can very quickly return to the darkness of the subconscious mind, never to be retrieved, so it’s important that they’re captured at the moment of arrival. Every single idea gets recorded, whether thrilling beyond measure, or mildly boring: there is no judgement at this stage. These notes might be individual images, lines of dialogue, chapter titles, character sketches, brand names for invented products, symbolic themes, poems, maps, pop song lyrics, diagrams, etc. Anything that might occur or belong in this world I’m creating. Over days or weeks or sometimes years a picture starts to form in the notes, and in my imagination; the possibilities of the story unfold. In the case of A Man of Shadows — a detective story set in a city that never goes dark and where the day has been split into thousands of contrasted time lines — a lot of the early notes dealt with the location, the city, its various areas, and with different concepts of time and timekeeping. The two main characters, Nyquist and Eleanor, arose from these thoughts: one is a private eye suffering mentally and spiritually from the adverse effects of multiple time-line addiction, and the other a teenage girl who appears in some way a natural embodiment of time, in all its mystery. Next to arrive was the basic plot. I needed a story that would force Nyquist to visit many different areas of the city, both dayside and nightside, so that I too could explore this new world I was building, street by street, precinct by precinct. I came up with the idea of a troubled runaway teenager, with Nyquist employed by the family to find her. His quest takes him from the slums to high-rise office blocks; he questions the young and the old, the rich and poor, wise women and crazy fools; he moves from drug dealers' dens to the artists’ quarter, visiting both the red light district and a luxury mansion; he travels from Dayzone to Nocturna, from the light to the dark. So for me, writing a novel is first of all an exploration of a mass of possibilities, and then a gradual honing in on the important matters: location, character, plot, atmosphere, and of course a killer twist! It’s an organic process. What I’m really waiting for is the big moment, the unseen truth, the crazy unexpected occurrence that excites me enough to keep writing, to work towards that moment in the plot, and then away from it. And in the case of A Man of Shadows, that moment brought with it the realisation that I needed a third area of the city, to complement Night and Day: a danger zone between the two. A place of secrets, of mystery. I needed Dusk. 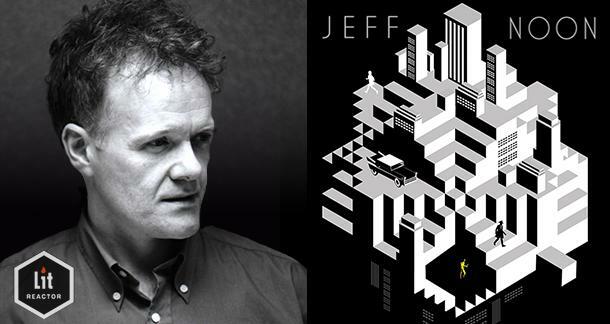 Jeff Noon is an award-winning British cult novelist, short story writer and playwright. He won the Arthur C Clarke Award for Vurt, the John W Campbell award for Best New Writer, a Tinniswood Award for innovation in radio drama and the Mobil prize for playwriting. He was trained in the visual arts, and was musically active on the punk scene before starting to write plays for the theatre. His work spans SF and fantasy genres, exploring the ever-changing borderzone between genre fiction and the avant-garde.